I'm delighted to be able to post these workshops dates for the New Year. There is always a demand for more beginners classes as I am continually meeting new people at craft events who are interested in learning to felt. Plus there are workshops for those who wish to move onto more advanced projects - soft pots & bags, slippers & hats, and even teacosys! "INTRODUCTION TO FELT MAKING" : Sat. 21st January. The 'Painting with Fibres' workshop is very popular and is now fully booked, so I've decided to amalgamate it with this workshop for beginners. On the day you will be shown the basic felt making processes and you can choose to either make a felt picture or you can experiment with blending colours & textures to make pieces of flat felt. There will be plenty of ideas & examples on display. "PAINTING with FIBRES" : Sat. 28th January. Fully booked! This workshop is for ALL abilities! Bring along a design or photograph as a starting point and make a felt picture. Basic felt making techniques will be explained, showing you how to create a design or landscape scene from multi-coloured 'pre-felts' and textures. See pictures above and more details here. "FELT JEWELLERY" : Sat. 4th February. Places still available! Another workshop for all abilities. Create felt flower corsages, beads & bangles using a variety of simple felting techniques. Make simple brooch designs working around a resist. Plus lots of ideas for decoration using needle felting, beads & embroidery. More details here. 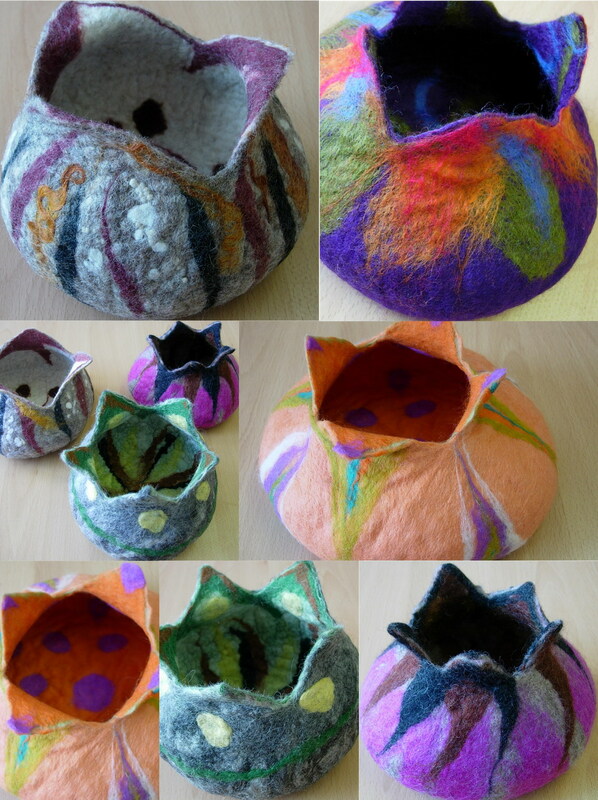 "FELT BAGS & BOWLS" Sat. 11th February. Places still available! This workshop is for those that have some felt making experience and wish to complete a 3-D project. You can choose to make either a seamless bag or bowl on the day. Lots of bag & bowl designs will be on display for inspiration, plus ideas for incorporating handles and decorating with textures, threads & beads. More details here. "FELT TEA COSY" Sat. 3rd March. Fully booked! A new workshop for those who want to learn how to work in 3-D. Come and make a cosy for a tea (or coffee) pot. These are easy to make, fun to decorate with 'pre-felt' designs and make wonderful presents! "FELT HATS & SLIPPERS" Sat. 10th March. Places still available! Come and make either a felt hat for yourself OR a pair of slippers, and make them as sensible or crazy as you dare... And if it's anything like previous workshops it will be a really fun day!!! 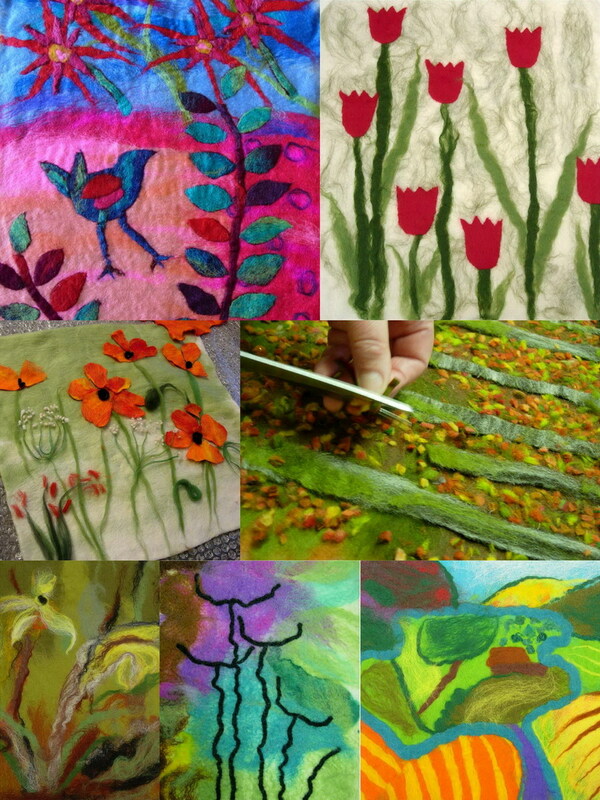 This workshop is for felt makers with previous experience of 3-D felt making. This workshop is for those of you who would like to make a felt case for your Kindle or I-Pad. It's a good first project to learn how to make a seamless shape around a resist. These felt covers make great presents and we will have plenty of time & materials to make a small matching I-Pod or phone case in the same workshop. All the workshops are held on Saturdays and will start at the slightly earlier time of 10.00am and run through until 4.00pm. They will be held as before in the West Wight Landscape Partnership conservatory at Maderia House, Avenue Road, Freshwater, PO40 9UU. All materials and equipment will be supplied and included in the cost of the day. This will be £25 for all the workshops, except "Felt Hats & Slippers" & "Tea Cosys" which will be £28 to allow for the extra fibres needed to complete the project. Numbers will be limited to 8 people. You will just need to bring a packed lunch (tea, coffee & biscuits will be available) plus an apron, extra towel and rubber gloves (if needed). Again, I'm really grateful to Pete Fellows, Manager of WWLP, for his continuing support in letting me use the conservatory at Maderia House for the workshops. It's a lovely light space, with lots of room. We have the use of the kitchen and FREE parking, at the rear of the building, on the day. 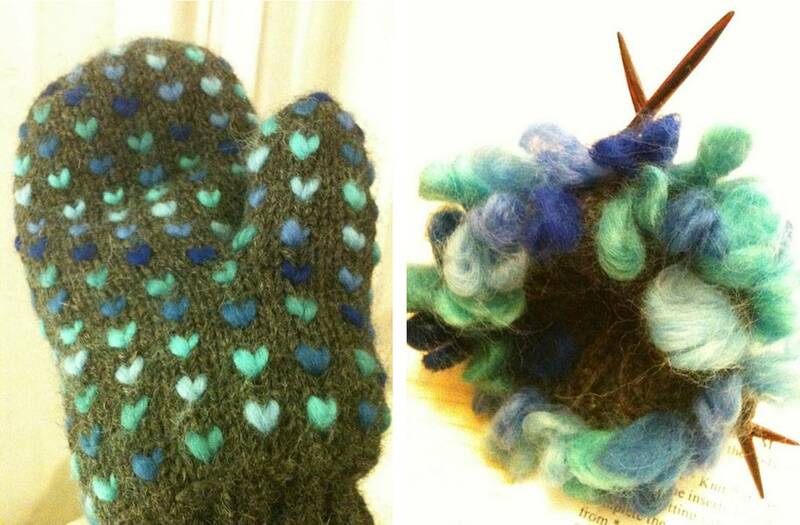 Not only do you get the beautiful heart pattern on the outside, but also a fleecy lining inside... How warm is that!